Hillary and Michael were such an amazing couple, and, as soon as we met them, we couldn’t wait to bring their purple and white wedding dreams to fruition. The duo met at a college wrestling tournament, where Hillary was collecting stats for her team and Mike was wrestling for his. They hit it off immediately and, with the help of their French Bulldog Stewie, Mike eventually popped the question. The pair chose to say I Do in July at the M Resort in Las Vegas. 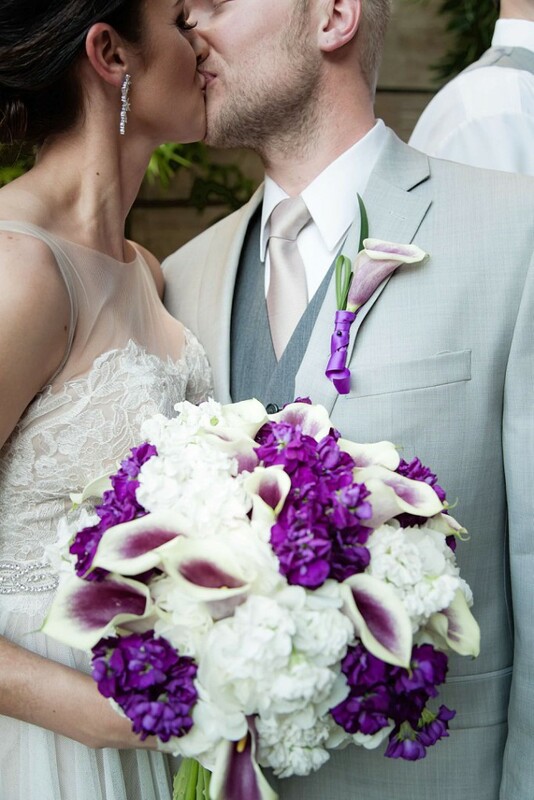 They decided on a dreamy palette of white with various shades of purple, which turned out to be a stunning choice. They asked for an aesthetic that was sleek and modern, so we worked with clean lines, modern design details and strategic lighting to bring their vision to life. 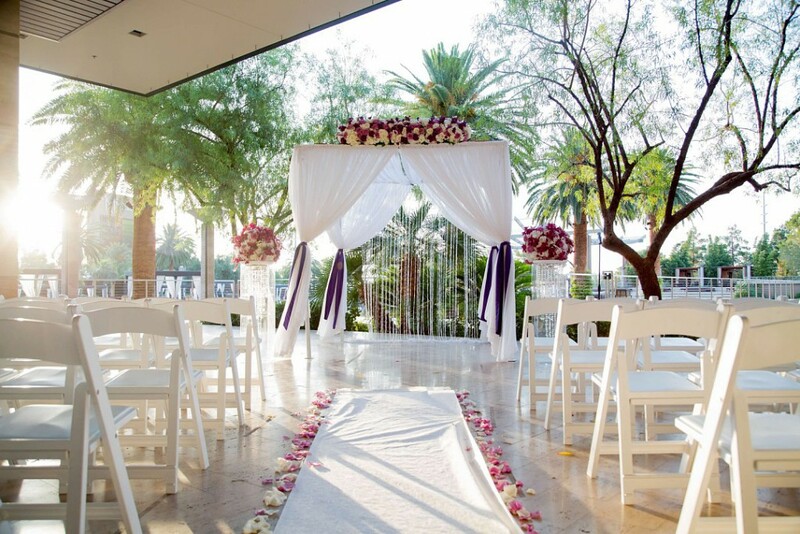 The ceremony took place outdoors on the terrace and Weddings By Dzign brought in a white chiffon chuppah for the altar space. 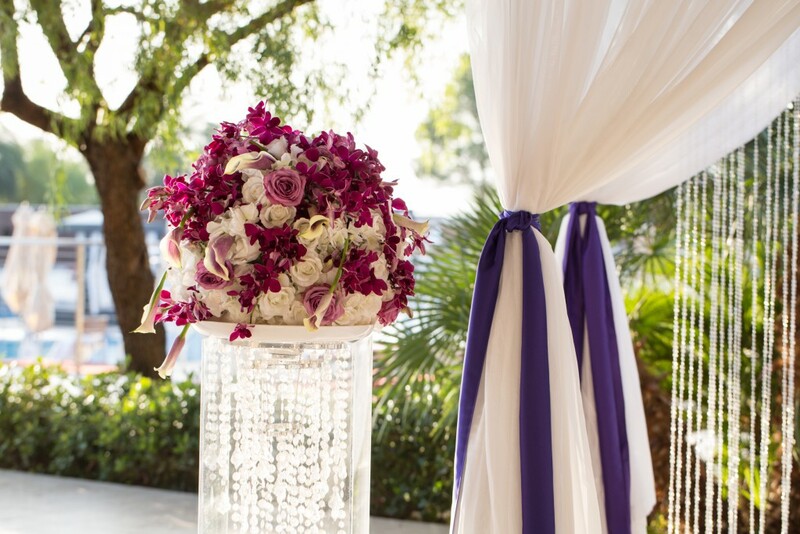 Floral By Dzign crafted a stunning (and massive) white and purple flower topper chock-full of white hydrangea, purple stock, ivory and lavender roses and Picasso calla lilies to really add some depth to the chuppah. 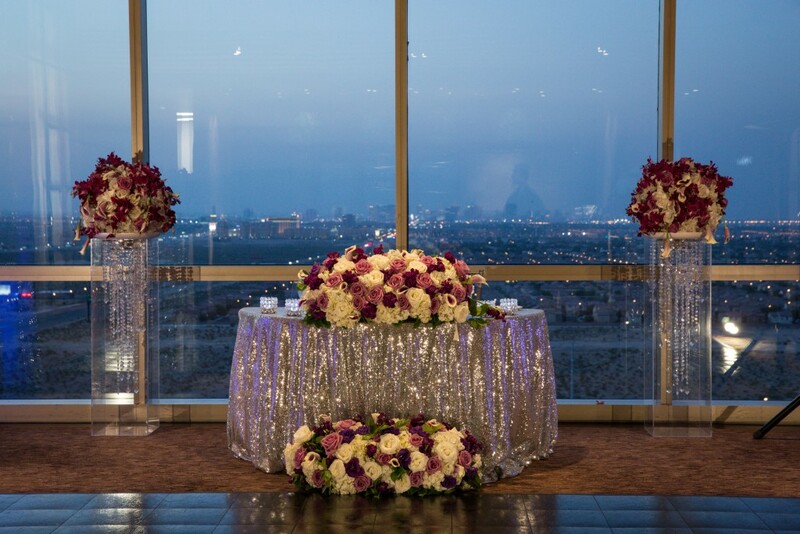 To help dress up the space, our floral team also created altar arrangements that consisted of white roses and purple dendrobium orchids atop our lucite boxes, which housed suspended chandeliers for some extra sparkle. For Hillary’s bouquet, we wanted to create something that was full of saturated purple hues. We ended up going with Picasso calla lilies, white hydrangea and purple stock, tied off with a simple ivory ribbon—and the pop of color looked stunning against Hillary’s gorgeous lace gown. 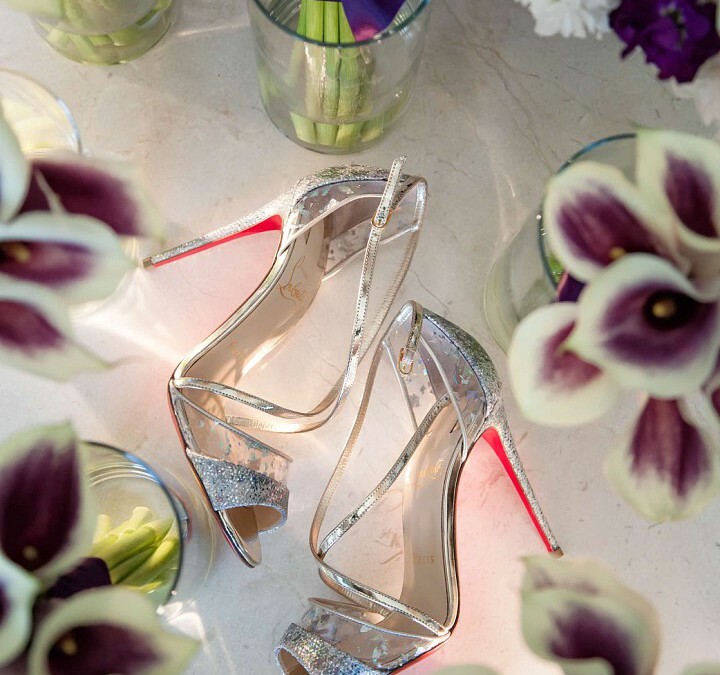 For the bridesmaids bouquets, we opted for something simple and chic that would stand out against their black gowns. 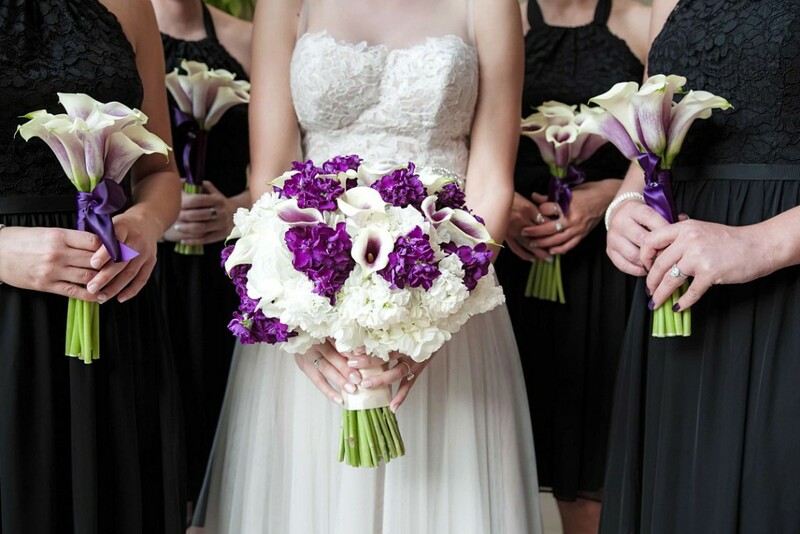 Our floral team ended up crafting small, focused arrangements of Picasso calla lilies, tied off with purple ribbon. 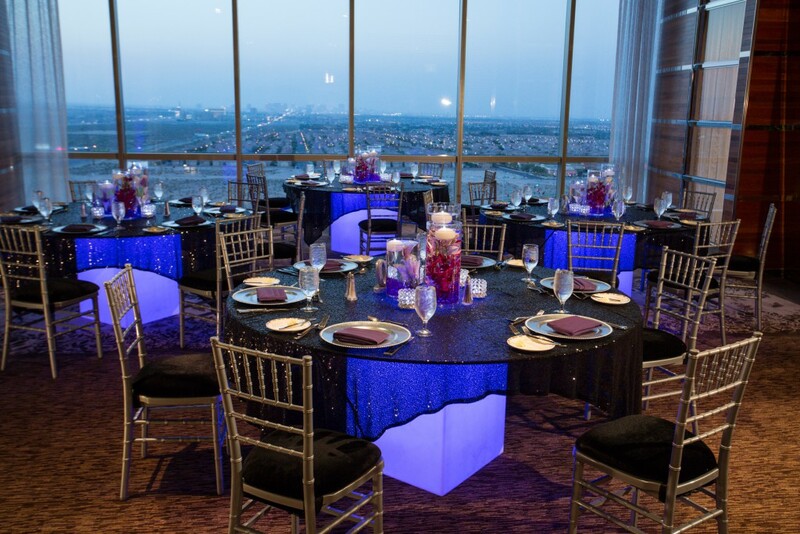 After the stunning ceremony, guests headed indoors to Lux at M Resort, which sits on the 16th floor and boasts floor-to-ceiling windows that are hard to take your eyes off of. We wanted to really bring that modern aesthetic the couple was looking for to life throughout the reception, and we placed a heavy focus on the guest tables in order to do so. We brought in our fan-favorite ghost tables, which our Lighting By Dzign team lit beautifully in purple. Linen By Dzign then dressed the tables in black sequin linens, which added such a chic and celebratory touch to the space. We placed silver chiavari chairs with simple black cushions around the tables, and for place settings, went with silver beaded charger plates and purple napkins. 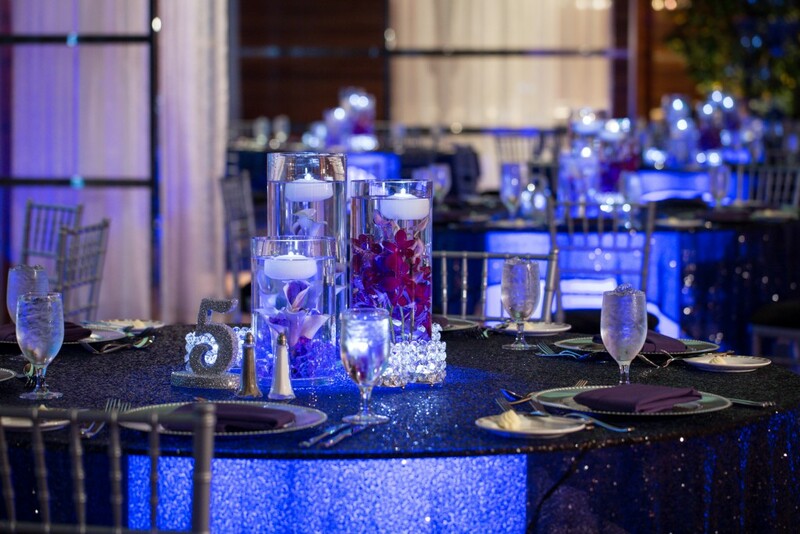 Centerpieces consisted of submerged Picasso calla lilies in cylinders of varying heights, accented with bling votives. The guest tables ended up being the couple’s favorite detail of the night. “Our favorite part of the design was the guest tables, which included everything from the lit tables to the sequined table cloths to the beautiful centerpieces,” Hillary said. For Hillary and Mike’s sweetheart table, we went with silver sequin linen with white-and-purple floral arrangements, bling votives, silver beaded charger plates and purple napkins. With such lush florals against a stunning silver linen, the table ended up being one of our favorite Sweethearts we’ve ever done. 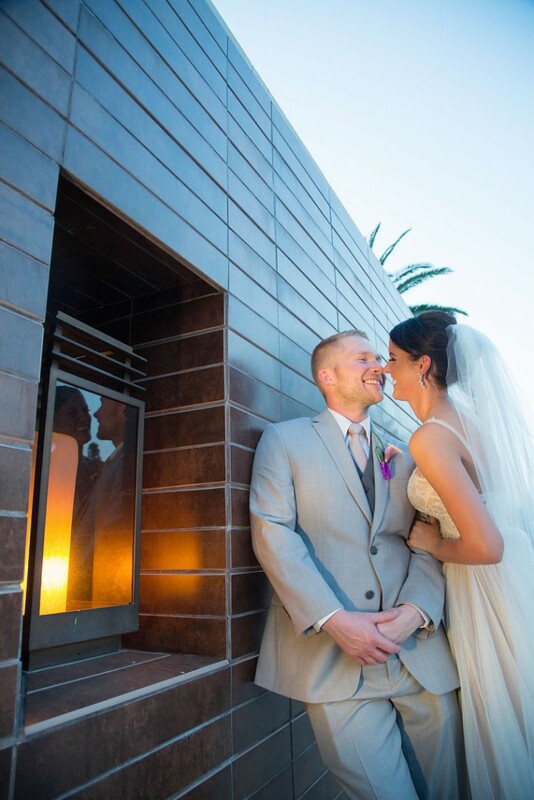 Overall, the couple’s white and purple wedding dreams came to life beautifully, and the M Resort provided such a great backdrop for the modern-and-sleek aesthetic they were going for. From linens that sparkled for days, to clean design lines, to every shade imaginable of purple, this one of our favorite weddings to date…and we’re so honored Hillary and Mike asked us to be part of their Big Day.